A US withdrawal has opened the door to a possible political settlement in Afghanistan, but success will depend on regional powers and the country’s neighbors. The peace and security field lags behind other sectors, like the humanitarian and development fields, in using data to drive innovation. It also lacks a community of practice across sectors (government, private sector, multilaterals, civil society). This community is needed in order to identify and build on lessons learned, prioritize the most important needs and gaps, and prevent duplication and supply-driven product development. 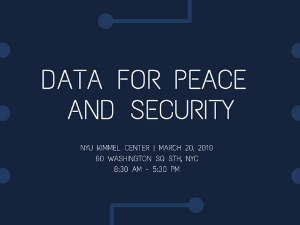 At a time of global peril, join the Carnegie Mellon’s Heinz College of Information Systems and Public Policy in Washington, New York University’s Center on International Cooperation, and the U.S. Institute of Peace for a lively panel discussion on how to mobilize behind a roadmap that will put peace at the heart of the 2030 Agenda. The Task Force on Justice, an initiative of the Pathfinders for Peaceful, Just and Inclusive Societies will present their report at the World Justice Forum VI in The Hague, defining the opportunity for the justice movement in 2019.